Fremont’s tidy tip-blow wife vernal pool alliance, a rare vegetation type found at the Merced National Wildlife Refuge. Photo by Gary Zahm. Over the 2016-2017 winter, the Conservation, Rare Plant, and Vegetation programs have initiated an effort to map Important Plan Areas (IPA) throughout California. With its diversity and endemism, the flora of California is unlike any other in the world, and CNPS is being proactive to protect and preserve its natural beauty and resources. The IPA initiative will produce tools that will aid and support decisions for local, regional, and statewide conservation planning. Goldfields blooming in an Alkali habitat at Semitropic Ridge, Kern County. Photo by Jennifer Buck-Diaz. The Rare Plant and Vegetation programs are gathering data available through past survey efforts and fine-scale vegetation maps – including GIS map data that are publicly available, and survey data that are currently being compiled in a statewide dataset by CNPS and California Department of Fish & Wildlife. We are consolidating this baseline botanical knowledge for California, and will present it through digital maps that highlight the locations of rare plant species and vegetation that have high priority for protection. However, in order to have a comprehensive map we need help from local experts and citizen scientists who know their local areas best. Valley Oak Woodland at the San Joaquin River National Wildlife Refuge, Stanislaus County. Photo by Gary Zahm. California is such a large state and we have a lot of ground to cover. 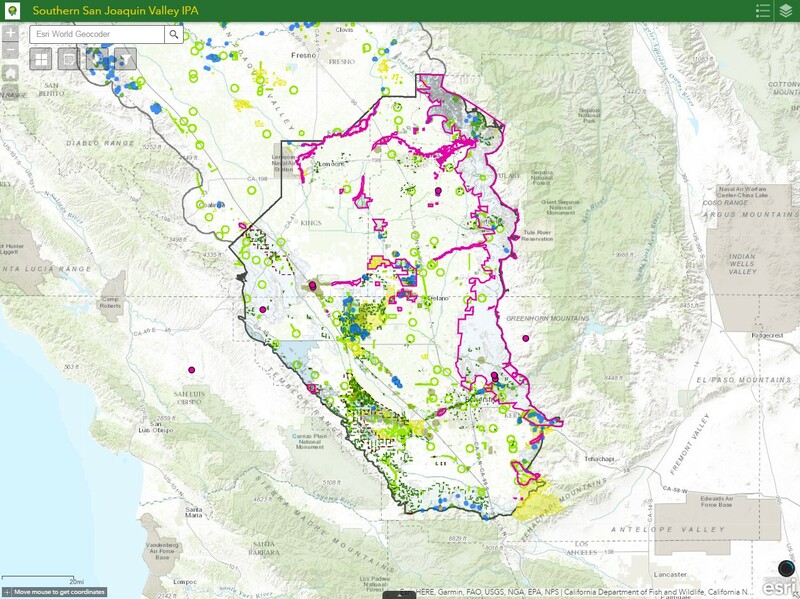 To start, we are focusing our efforts on regions where conservation planning is currently taking place, such as the San Joaquin and Sacramento Valleys. Our first pilot region is the southern San Joaquin Valley. Although much of this region has been urbanized or converted to agriculture, there are remaining natural areas that are unique or rare, including vernal pools and riparian and alkaline habitats. Identifying these areas is important so we can advocate for their preservation during conservation planning. A map of the southern San Joaquin Valley, our pilot area for the Important Plant Area Initiative. To gather additional knowledge for the southern San Joaquin Valley, we hosted an IPA workshop in Bakersfield this month. This workshop brought together a group of individuals to help contribute knowledge of rare and special plants and communities in that region. We will add the new knowledge gained during this workshop to the existing information we have to better define IPAs for the region. Next, we will then expand our efforts to other regions of California starting with the remaining areas of the Great Valley and ultimately reaching our goal of a map of IPAs for all of California. The Important Plant Area initiative, funded in part by the Giles W. and Elise G. Mead Foundation and an anonymous donor, is fundamental to what CNPS has always done. We put together what we know about California’s flora, share the information with others, and protect places through science-based advocacy and our passion for plants and their natural habitats.